Pictures are a beautiful addition to my office. Came is a well packaged box. 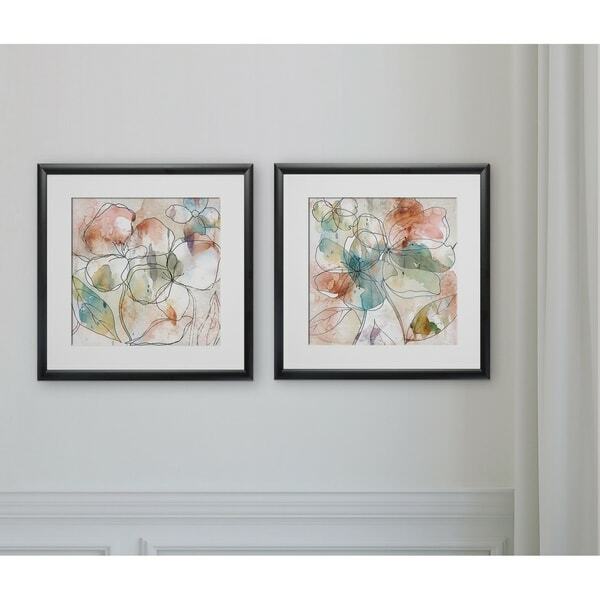 Floral Flow -2 Piece Set 2 Custom Framed Prints. 100% and created to last. Individually printed and framed by hand to very high standards. Printed and inspected one at a time utilizing the latest archival UltraChrome Giclee inks Consisting of 2 Total Framed Pieces Each measuring 16''x16'' x .75'' deep Each Piece is Individually Framed Acrylic Glass Each piece includes hanging accessories and is ready to hang. You need only to apply an anchor to the wall of your choice. I have a floral upholstered chair in my sunroom. These prints have a similar abstract floral pattern are very complimentary. Wish they were a bit bigger but still a great choice.